This article is a postscript to a recent article called Israel, Iran, and the Ishmaelites, which emphasized the present desperate Saudi push for Mideast peace. In a nutshell, Saudi King Abdullah took his Mideast peace plan of 2002 out of the archives and pitched it to the Arab League in Cairo on July 28, 2010. As a result of his stature and salesmanship, the Arab League pledged their support to Palestinian President Mahmoud Abbas to enter into face-to-face “Direct (peace) Talks”, should he desire, with Prime Minister Benjamin Netanyahu. This geo-politically expedient Arab League decision came on the heels of Netanyahu’s July 6, 2010 comments that he is willing to conduct “Direct Talks” with the Palestinians. All of the above came as good news to U.S. President Barack Obama, who from day one in the oval office has advocated a Mideast foreign policy of “Engagement.” His aim is to have all adversarial parties in the Mideast talk through their territorial and ideological differences. Some have criticized his “Engagement” policy calling it naïve; however, volatile Mideast conditions seem to be pressing the need for final diplomatic discussions. Departing with a sense of accomplishment, Saudi King Abdullah left Cairo and headed for a historic Beirut conference with Syrian President Bashar Assad and Lebanese President Michel Suleiman. 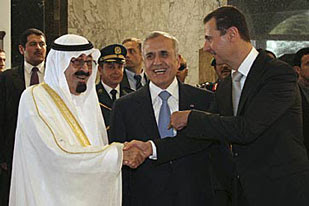 King Abdullah had not visited Beirut since March of 2002 at which time he had pitched his peace plan to the Counsel of Arab States. This extremely pro-Arab peace plan was accepted by the Arabs at the time. However this trip, somewhere in the 363 mile shuttle between Cairo and Beirut, Abdullah’s previously endorsed peace plan lost its importance and sense of urgency as the Saudi King was forced to abruptly shift his focus toward mounting tensions in Lebanon. The Beirut summit primarily ended up addressing genuine concerns that Sunni-Shiite violence could erupt as soon as the results are made public of the UN court probe into the assassination of former Lebanese Prime Minister Hariri in 2005. The UN court is apparently preparing to implicate members of the powerful Hezbollah in Hariri’s murder. Hezbollah is not expected to respond favorably to any assassination indictments from the UN. In fact, recent increased Hezbollah troop buildup in Southern Lebanon has caused Lebanese villagers in the area to clash with UNIFIL (United Nations Interim Force in Lebanon) soldiers. Furthermore, Hezbollah has essentially disqualified the role of the UN in Lebanon over the past four years by defying UN Resolution 1701. This UN resolution called for the disarmament of Hezbollah in the aftermath of its 34-day conflict with Israel in the summer of 2006. Presently Hezbollah has assembled an arsenal of approximately 60,000 more advanced rockets, inclusive of Syrian Scud Missiles, and they have accomplished this during UNIFIL’s watch. July 8, 2010 - Israel posted aerial photos on an official website inclusive of detailed maps and 3-D simulations locating Hezbollah deployed troops into Southern Lebanon. Reportedly 20,000 Hezbollah troops are presently positioned in hiding in hospitals, homes, schools, and other civilian locations in Southern Lebanon. July 9, 2010 to present - UNIFIL forces clash with villagers in Southern Lebanon who are concerned that UNIFIL's increased patrolling, the result of the Hezbollah troop buildup, would hinder Hezbollah's ability to protect the villagers in the event that Israel attacked Lebanon. July 11, 2010 - Hezbollah’s commander in Southern Lebanon, Sheik Nabil Kaouk declared Hezbollah has a "bank of targets" located inside of Israel and that presently they can "strike anywhere inside of Israel." More recently on August 3, 2010 - Lt.-Col. (res.) Dov Harari, 45, from Netanya, was shot dead by a sniper from the Lebanese Armed Forces and a company commander from his battalion, Capt. Ezra Lakia, sustained a gunshot wound to the chest. Abbas has expressed on several recent occasions that he is not interested in direct talks with his Israeli counterpart unless certain preconditions are met. Namely, he wants Israel to freeze all settlements and allow a third party, like NATO, to be the guardian of territory Israel acquired in 1967. Abbas wants Israel to provide this land for the creation of a Palestinian State with East Jerusalem as its capital. Although the Saudi Peace Plan calls for this, it is unimaginable that Benjamin Netanyahu and his current right wing coalition will ever agree to it. Abbas is merely a propped up figment figurehead of the international community’s imagination. He, nor his Fatah party, represents the majority will of the Palestinian people. The Hamas party and its leadership are the democratically elected party of the Palestinians as of January 2006. Hamas is not interested in a Two-State solution. The Hamas charter calls for Israel’s destruction through Jihad and for the consecration of a final Arab State in the Middle East called Palestine. The Arab League has made it clear that they believe peace cannot be achieved with the present Netanyahu Administration. This implies they don’t expect a viable peace is currently achievable and therefore all present negotiations are essentially meaningless. The Arab League’s new position forces the Obama Administration to pressure Israel into accepting the preconditions of President Abbas before direct talks can begin. This is not likely while the Netanyahu right wing coalition reigns sovereign over Israel. The Israeli–Palestinian conflict represents only a segment of the overall complex Mideast peace predicament. Israel is also at odds with Syria, Hezbollah, and Iran. Additionally, Turkey has recently become adversarial toward Israel complicating the entire Middle East peace process. The Arabs have internal geo-political and religious conflicts amongst themselves. For instance, Sunnis and Shiites have Islamic ideological differences. Additionally, the Saudis are very concerned about the proxy relationships, sealed by bonafide war pacts, between Hezbollah, Syria, and the Hamas with Iran. The Arabs have conflicts with Iran in addition to Israel. As pointed out in the Israel, Iran, and the Ishmaelites article, Saudi Arabia is very concerned that Iran’s nuclear aspirations may extend into a war between them and Iran. These are just a few of the reasons Middle East peace continues to allude the grasp of the international community. King Abdullah’s peace plan has mustered up Arab League support for “Direct Talks” between the Israelis and Palestinians. Additionally, it has encouraged President Obama that the Arab League seems to appreciate his Mideast foreign policy of “Engagement”. However, the current content of the Saudi Peace Plan will prevent Israel from accepting it as a legitimate plan for Mideast peace. Tensions in Lebanon may push the Saudi Peace Plan back into the archives where it had been collecting dust for over 8 previous years.